Auction Decorating: Modern details - decorative and practical too! Decorating is often in the details. You can have an IKEA bookshelf or table, but if it's topped with wonderful objects no one will ever notice. In this library, the shelves are a wonderful mix of decorative objects and books. The room is otherwise simply furnished, but your eye is drawn to all the interesting pieces placed at different levels among the books. 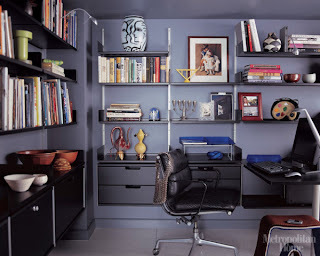 This home office is all about the decorative details. The simple shelving has a wonderful collection of pots and vases, along with the books, making an interesting tableau. The next Wright auction in Chicago on 28 April - 'Living Contemporary' - is my inspiration today because it's full of fabulous modern objects that would be chic decoration, but can be put to work as well. Bookshelves should always include some decoration along with the books. These bookends would be incredibly stylish on the bookshelf, or on a table holding up a select group of favorite books. 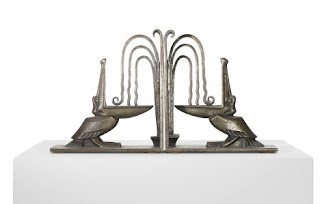 This Art Deco pair were designed by Edgar Brandy (French circa 1926). They are in the shape of pelicans, made of wrought iron, and stand 7" tall. These are Lot 121 in the Wright auction with an estimate of $1,000 - $1,500. 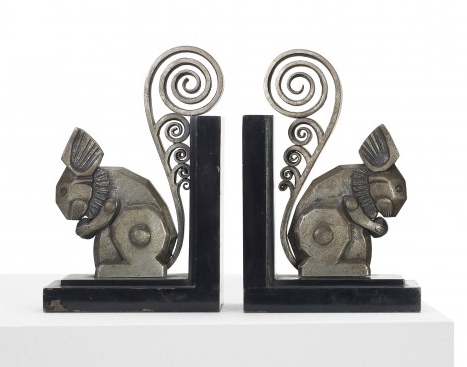 The auction also includes this really cute pair of squirrel bookends, also of wrought iron. These did not have a designer noted, but are also French circa 1920. These are Lot 254 with an auction estimate of $1,000 - $1,500. I get lots of shelter magazines every month. I like a nice magazine stand (or two) to hold them stylishly until I'm ready to recycle them. 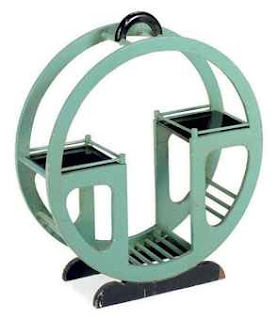 This Art Deco (circa 1925) painted circular magazine stand would serve the purpose and be decorative too! This sold at Christie's in New York for $188 off an auction estimate of $300 - $500. A colorful vase on a bookshelf or table will draw the eye, and add lots of interest. On a gray day in the Spring, add flowers and your mood will pick right up! 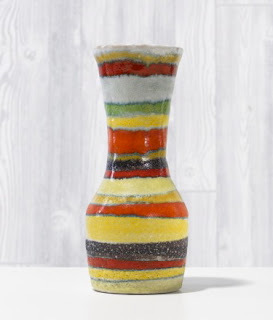 This vase was designed by Guido Gambone (Italian, circa 1960), stands 9" tall, and is made of glazed stoneware. It sold at a Wright auction for $1,500 of an estimate of $1,500 - $2,000. 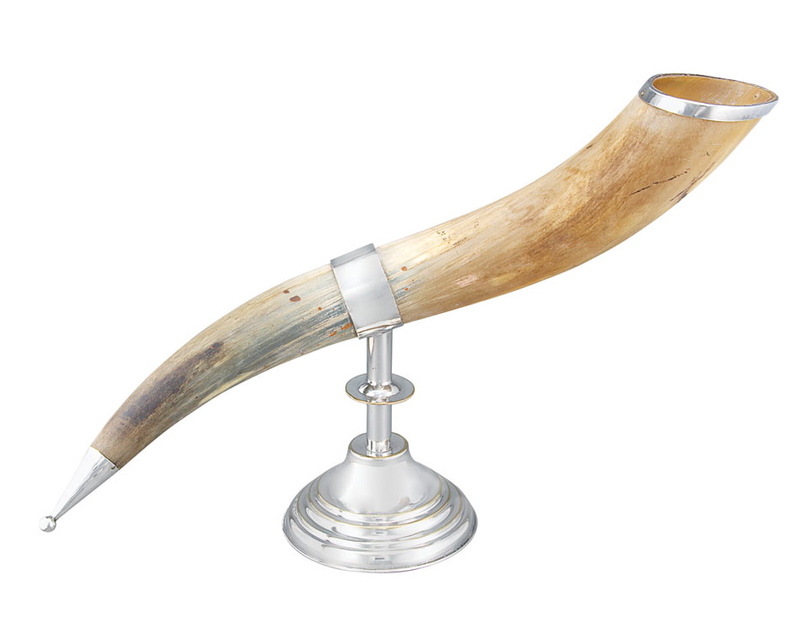 Horns make striking decoration. This one that sold at a Doyle New York auction has a terrific mounting and could be used as a vase as well. This sold for $188 off an auction estimate of $250 - $450. Lamps can, of course, be highly decorative as well. 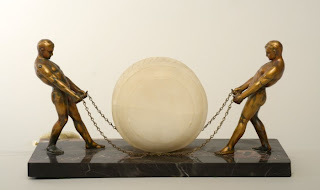 This Art Deco alabaster, marble and patinated metal figural console lamp is more sculpture than lamp! What a wonderful object to have on a table or shelf. This sold at a Stair Galleries auction in Hudson, NY for $225 off an auction estimate of $100 - $200. You wouldn't need to plug it in to have it look great. Building a collection of great objects can take place over many years. Just keep your eye out to snap up something really interesting, and build the design on a shelf or table. Each time you add a new piece it will take on a different character and stay fresh.